Pormer PhD student and postdoctoral research associate working on microbial adhesion and polymer surface diffusion. Ana Lorena Morales-Garcia is from Pachuca in Mexico. She got her degree in Chemistry in 2008 at Universidad Autónoma del Estado de Hidalgo, which is the State University; Pachuca is the capital of Hidalgo. We are lucky to have Ana here working on the interaction between bacteria. She is working in a collaboration with the Department of Animal and Plant Sciences with Dr Steve Rolfe as co-supervisor. Ana came to Sheffield in September 2008 to do a PhD with integrated studies, which meant that her first year involved taking the MSc in Nanoscale Science and Technology, which is offered jointly with the University of Leeds. 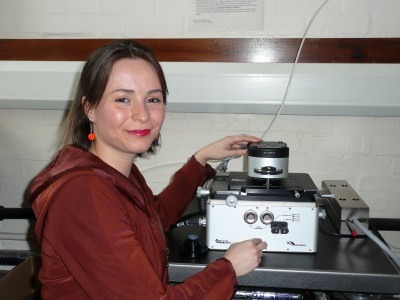 Ana spent her PhD mapping individual cells with atomic force microscopy, especially the chemical force variant, in which the AFM tip is coated with a monolayer of polymers or metal. She also studied bacterial interactions with biofilms. Her work was part of the Cell-Mineral Research Centre of the University of Sheffield. After siubnitting her thesis, she joined the Low-Dimensional Chemistry programme grant team to work on polymer surface diffusion. On Wednesday May 7, 2014 Ana successfully defended her thesis before her examiners, Professors Cameron Alexander (University of Nottingham) and Catherine Biggs (then of the University of Sheffield but now at Newcastle University). Ana finally took a fully funded postdoctoral position from P&G, who were impressed with her thesis. She did more postdoctoral work with them but this time at Newcastle University (there they go again, stealing our people!) before P&G bowed to the inevitable and hired her. Content © 2019 Mark Geoghegan or as indicated.